This months Repeater Talk article will focus on the difference between traditional FM repeater use and the Digital Modes such as C4FM – System Fusion. Let’s start with a discussion on single flow. 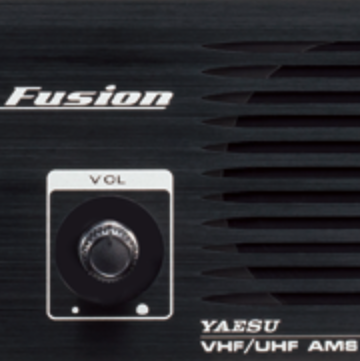 So how does this change when we use a digital radio such as the Yaesu System Fusion C4FM ? Let’s take a look at a simple block diagram that represents the signal flow in Analog as compared to Digital. Note that in our traditional Analog transceiver we send the signal directly to the receiver for processing and then onto the speaker for our ears to process. In a similar way the sound of our voice is picked up by the microphone and sent to the xmit’r for processing on its way to the antenna and off to the air. Wherein a Digital transceiver the signal has an additional process to pass through before it can be used by the human operator. That being the Analog to Digital or Digital to Analog Converter. These DA or AD converters act as the translators to move our analog voices into the C4FM protocol (AD ) that is sent over the air. The receiving radio then hears a C4FM signal and by using the Digital to Analog ( DA ) converter makes it again a sound that the human operator can understand. Why do this you might ask? In the case of digital radio many benefits can be had – one of my favorites and the topic of an upcoming “Repeater Talk” is metadata. Metadata is the additional information that can be bundled into the signal and available for all sorts of applications. As I mentioned – more on that topic in the future. Other benefits can include – reduced bandwidth needed, enhanced interference coping, digital data transfer, and arguably better performance and lower cost to produce and purchase. We will see with time how the cost benefits to the producers translate to savings to the Ham community – but if current pricing continues – the Yaseu System Fusion Radios remain a bargain in the market place or competing digital systems. Stay tuned to RepeaterTalk for the latest on our DVRA/W2ZQ System Fusion repeater upgrade.